Diet Pepsi “After Hours” is a 30-second, fully computer generated commercial recently produced for showcase during the 2005 Academy Awards on American broadcast stations. It was completed in about one and half months, with a crew of about 8 core artists at Redrover Animation Studios Ltd.
“After Hours” focuses on creative story development, stylized character animation, dramatic cinematic lighting and clean, sophisticated rendering. The concept was to show a closed convenience store in which a radio was left playing in the background. As we cut to the inside of the refrigerator, we think the (talking) products are agitated by this only to find out they are actually annoyed by the cans partying above them. We then cut to the top level where the Diet Pepsis are rocking out to The Ramones. To find out what happens next, you’ll have to download the movie below the following images. “After Hours” was extremely challenging to execute technically and creatively. Not only did we have to model an entire refrigerator and every product within it, but we also had to model an entire convenience store with two aisles stocked full of non-existing products as well as create textures for every single one. As a result, this ate away a great deal of our schedule and it also became an intensely heavy scene to render due to the massive amounts of geometry and textures. As usual, we did an extensive amount of research and reference on convenience stores (courtesy of “Convenience K”), and their refrigerators which we based our modeling designs on. The animation phase underwent the usual process we take in producing commercial animation. We started with a rough animatic, and continually updated each scene every week until our scheduled time ran out. We then continued to tweak animation to the last moment, even during the lighting and rendering phase. Particularly challenging was finding a compromise in the style of animation. Pushing the characters too far started making them look rubbery, while not taking them far enough restricted their performance which was required to tell the story. 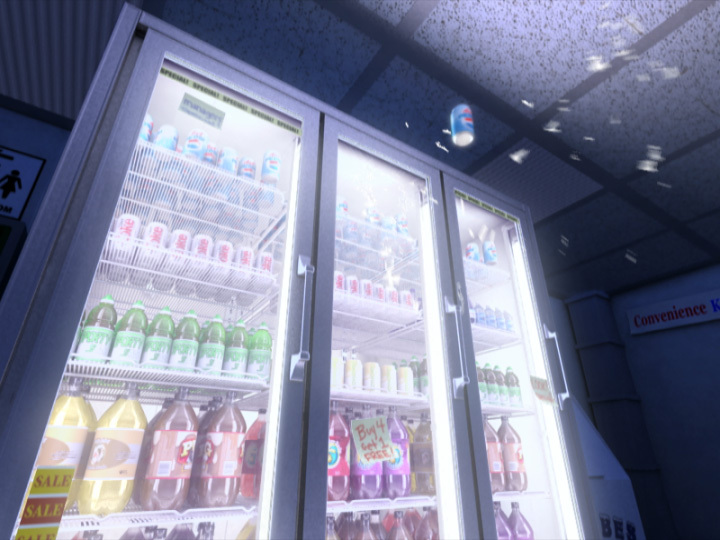 Because “After Hours” was completely raytraced and rendered using global illumination lighting techniques, rendering quickly became a problem, especially in scenes involving 30-50 animated cans. Rendertimes for characters approached 2-3 hours per frame, while some backgrounds peaked at 10-12 hours per frame. As a result, we rented an additional 20 rendering boxes and added a 10 CPU Blade Server to our already existing 20 machine renderfarm and 10 workstations. This totalled approximately 60 rendering computers which were working 24 hours a day non-stop for the duration of the production. Needless to say, we blew several power switches along the way. Among the voice talent were Estelle Harris, George Costanza’s TV mom, doing a fantastic job for the Diet Cokes. 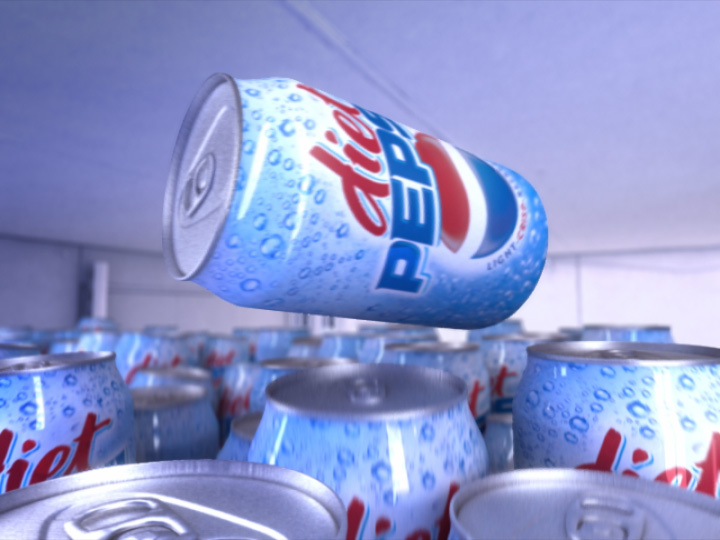 Diet Pepsi “After hours” was was modeled, textured and animated with 3D Studio MAX 6.0, rendered with VRay 1.45.70 using global illumination techniques in combination with traditional lighting rigs, and composited with Combustion. Animation Production Company: Redrover Animation Studios Ltd.
Music: The Ramones, "Blitzkrieg Bop"